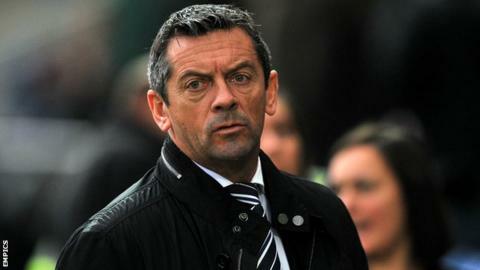 Southend United boss Phil Brown has urged the club to follow through on their promise to build a new stadium. Shrimpers chairman Ron Martin has had plans for a new ground for 15 years, with work expected to start next month. "The chairman has brought me to the club to get promoted. That's the deal, and I accept the deal," Brown told BBC Late Kick Off East. "I'm just hoping he accepts my side of the bargain, which is to start building a new stadium." Southend finally received permission to build a 22,000-seater stadium in 2008, with their new home to be built at Fossetts Farm, a location behind the club's current training ground. But the move has been an ongoing saga, with the financial crisis and issues with the local council meaning construction start dates have been perpetually delayed. If the move goes ahead, the Shrimpers' current home at Roots Hall will be knocked down to build a supermarket. Brown, who managed Hull City in the Premier League, agreed to take over at League Two Southend on the proviso that a new stadium was forthcoming. His side are currently among the play-off contenders, and he believes the Essex club can return to the Championship for the first time since 2007 - but only if the long wait for a new home comes to an end. "The play-offs were part of the remit when I did the interview with the chairman," he said. "It's to go hand in hand with the building of the new stadium. "When we cut the first sod, which we're hoping will be next month, it's a 12 to 14-month building project so you're hoping to be in a higher division, if not two. That's the deal on the outside looking in. "The stadium is part and parcel of why I'm here. I've been involved at Bolton, Derby and Hull, who have all built new stadiums, and Preston, where they were rebuilding inside the walls of the stadium. "You'd be amazed at what a new stadium can bring. "It doesn't get rid of your history, it just enhances your history and certainly enhances your future. "It would be crazy for me to come all this way down in divisions if there wasn't a bigger plan to get promoted and then to go forward as a bigger football club."